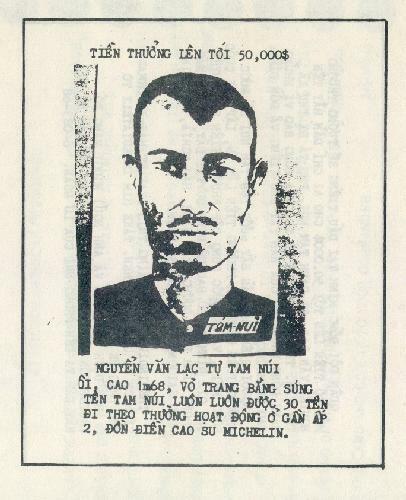 The subject of reward leaflets used by the United States and the Government of Vietnam during the Vietnam War is intimidating. The problem is not a shortage of data, but because there is so much information available on the subject. To study such a large category of psychological operations (PSYOP), we must make certain arbitrary decisions. We must decide if we will mention all rewards, or just a specific category of rewards. For instance, The Allies have offered rewards for both friendly and enemy individuals, human remains, large enemy military units, intelligence information, and various types of military hardware and materiel. In this article, we will illustrate and discuss all of the various types of reward leaflets, illustrating a few of each type and attempting to depict a variety of PSYOP techniques. The Department of the Air Force of the United States of America offers a reward of $35,000VN for the recovery of, or information leading to the recovery of, Lt. George E. Flynn, who is a pilot of the U.S. Air Force. Lt. Flynn was flying an A1E Skyraider, last seen early Wednesday morning, 23 September 1964, flying over the Dong Thai outpost, Hieu Le District, Kien Giang Province. Information leading to the recovery of Lt. Flynn should be communicated to the nearest ARVN Military Commander, U.S. Sector Advisor, or the Commander of the U.S. 2nd Air Division. After giving the information and collecting the money, the bearer of this leaflet will be completely free to come and go as he pleases. (Signed) U.S. 2nd Air Division. This leaflet is coded SP-188. Despite our best efforts, Lieutenant Flynn, who disappeared when his A1E Skyraider went down, was never rescued nor did he return with the other American POWs at the end of the Vietnam War . His remains were recovered 13 January 1974 and were positively identified on 13 January 1976. George Edward Flynn III is honored on the Vietnam Veterans Memorial on Panel 1E, Row 64. A reward of $35,000VN will be paid for information leading to the recovery of an American pilot and his parachute who jumped from a two-engine aircraft on 23 November 1963. The aircraft crashed 5000 meters northeast of Xa Bo Dap on that day and the pilot jumped from the airplane about 1600 meters north of that spot just before the aircraft hit the ground. $17,500VN will be paid for information more recent than 1 December 1963, leading to the recovery of the pilot's parachute alone. If you have any information about either the pilot or the parachute, contact the District Chief, or the Province Chief, or the Commander of the ARVN, civil guard or self defense corps unit who will notify the Commander of the 2nd Air Division or the Commander VNAF. The leaflet is coded SP-61. We discuss the SP leaflet in greater depth later in this article. The International Herald Tribune of 17 July 1967 features an article with the headline "Pledge in 16 Million Leaflets - U.S. Offers '50 taels of Gold' For Aid to Downed Pilots." The article, postmarked "Saigon" says, "The United States has offered a reward of 50 taels of gold to North Vietnamese who help American pilots shot down in North Vietnam escape. The gold is worth about $760. The offer was made late last night when American planes showered some 16 million gold-colored leaflets over North Vietnam's southern areas. Helping American pilots and other U.S. military personnel escape to freedom can bring you 50 taels of gold. If you see an American who has parachuted to the ground or who has escaped capture, do not be afraid. Approach him. Make him understand you wish him no harm by raising your hands. Help him in any way you can. Hide him from hostile authorities. Cooperate with him in finding his way to safety. You may escape to freedom or return home just as you choose. You will be paid the 50 taels of gold at the time the American is rescued or at any other time you wish. You may collect the reward in gold bullion or in the equivalent amount of any currency you choose. Payable in any free world country you choose. Dont recall if I mentioned this before, but printing presses and their operators were of course valuable items to both sides in Viet-Nam. A couple of our operators were approached at different times by the other side to come and work for them. All living expenses, a large gold payment, and interesting fringe benefits were offered. By the way, we found one Saigon printer doing work for both sides - what tipped us off were common marks in the type being used. If you see a Communist-fighter parachuting to earth or escaping capture, dont be frightened. You should walk up to him, raising your hands to show your friendship and that you have nothing that can harm him. Take him to a place where he will not be found by the authorities. Help him if he is injured in any way. Cover him from sight if you have to transport him by boat or car. Soon after you have helped him to a safe place, he will be rescued and your great humanitarian act will be richly rewarded. You and your family may enjoy a safe and easy life in Free Vietnam, or, if you prefer to remain in the North, your rescue work will be rewarded immediately by a gift of 15,000 dong. Sometimes our POWs did make it back. On October 29, 1963, Special Forces Officer 1st Lieutenant James "Nick" Rowe was one of several special forces advisors assisting the Vietnamese government in the training, equipping and employment of the Civilian Irregular Defense Group (CIDG) forces. The team (Detachment A-23) left their camp at Tan Phu for the village of Le Coeur. Along the way they ran into an ambush and Rowe was captured. For 62 months, Rowe battled dysentery, beri-beri, fungal diseases, and grueling psychological and physical torment. Each day he faced the undermining realization that he might be executed, or worse, kept alive, but never released. His home was a wooden cage, three feet by four feet by six feet in dimension. His bed was a sleeping mat. In spite of all this, Rowe was a survivor. From the start of his capture, he began looking for ways to resist his captors while he could make plans for his escape. Rowe made several unsuccessful escape attempts which only resulted in furthering angering his captors. Finally in December 1968, his captors had had enough with his refusal to accept the communist ideology and his continued escape attempts, Rowe was scheduled to be executed. Stanley Sandler says in Cease Resistance: It's Good for You: A History of U.S. Army Combat Psychological Operations, 1999: "The experience of one Special Forces Office, Lt. James 'Nick' Rowe, formed the basis for at least one US PSYOP leaflet. Rowe had been held in a Viet Cong bamboo cage for no less than five years, but just before his escape he had noticed that his captors were confused and bewildered because their old sanctuaries were being invaded by what had been dismissed by their cadres as 'weak' United States and Government of Vietnam forces. Many of them would have liked to give up the struggle but were afraid of being killed while trying to defect. A leaflet was quickly printed up with a message from Lt. Rowe reassuring his former captors that they would be welcomed and treated decently." Lieutenant Rowe documented his POW experience in a book titled Five Years to Freedom. He also went on to attain the rank of Colonel and became a legend in the world of Special Forces. You can learn more about Colonel Rowe and his untimely death by assassination by clicking here. 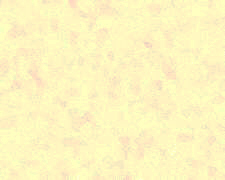 Lieutenant Rowe's leaflet is coded 10-070-6. The 10 in the code signifies that the leaflet was printed by the 10th Psychological Operations (PSYOP) Battalion. In IV Corps, the 10th PSYOP Battalion of the 4th PSYOP Group was formed from the 19th PSYOP Company at Can Tho, where it operated until it departed Vietnam on 16 April 1971. The declassified secret USAF report: Psychological Operations Air Support in Southeast Asia June 1968  May 1971 mentions the reward for prisoners campaign and admits that it was not successful. 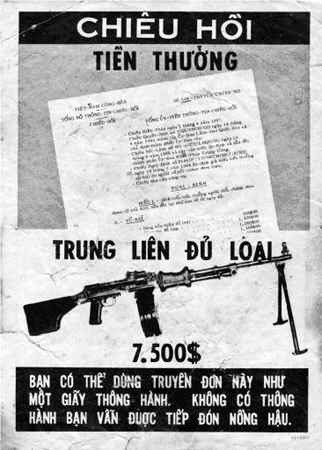 The Rewards programs were various leaflet campaigns which offered payment to Vietnamese for assistance given to and information regarding the location of downed U.S. flyers or other detained allied personnel. 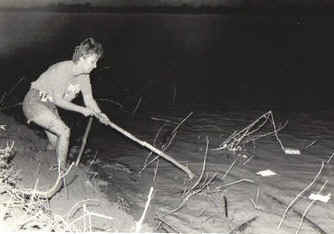 This type of program had begun in June 1968 with a campaign called Elephant Walk which advised the indigenous population that they would be paid large sums of money for assistance in the rescue and return of allied personnel or lesser sums for information which would lead to their rescue. Leaflets were dropped in the vicinity of suspected prisoner camps. The 9th Special Operations Squadron supported the program with an approximate monthly leaflet drop of 1.2 million leaflets. Unfortunately, for a number of reasons, the results from the program were disappointing. Leaflets had to be precisely placed in areas bordering known prison camps but the camps were constantly being moved. Appeals based on cash rewards were unsuccessful with the communist sympathizers living near the camps because they seemed convinced the communist cause was just or they feared reprisal. Prison camps were located in areas of low population density. DO YOUR PATRIOTIC DUTY AND YOU WILL BE REWARDED! If you show us where to capture or destroy a Viet Cong weapon, you will receive a reward of 50,000 Piasters. 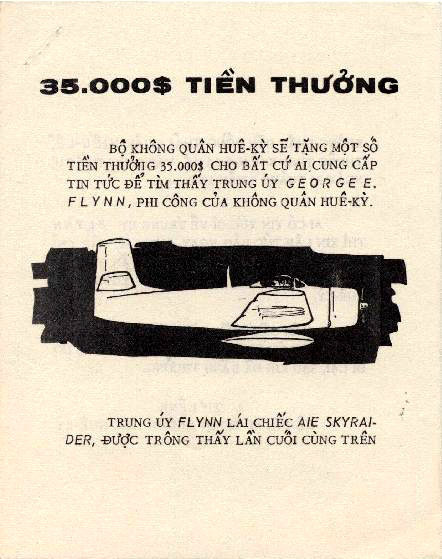 This 1967 leaflet also depicts American and South Vietnamese boats. On the front a Communist supply ship and two Allied boats are depicted. A young Vietnamese citizen calls an officer and tells him where the Communists have unloaded their supplies. In the last picture he is handed a stack of banknotes for doing his patriotic duty. The back of the leaflet pictures the Communist ship in greater detail and then the beach covered with tons of war materials. 2. 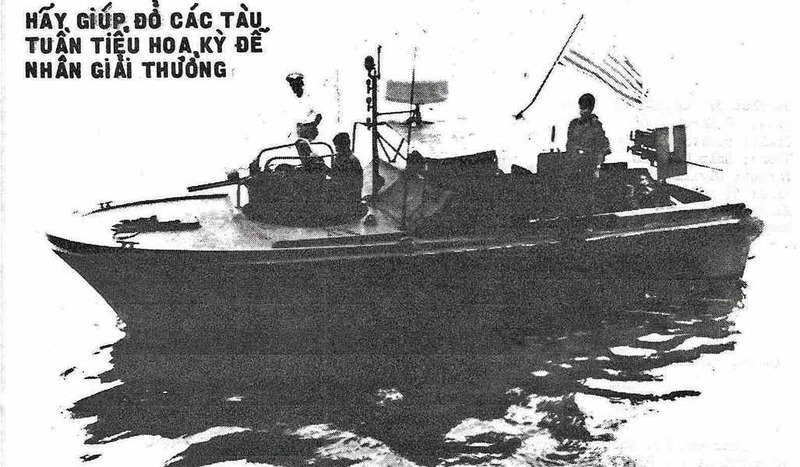 Contact a South Vietnamese or American patrol vessel like one of those pictured below, or contact local authorities. 3. Report what you saw. 4. You will receive a cash reward and you will be protected. The reward programs in Vietnam were endless. The Joint Chiefs of Staff (JCS) proposed "Operation Fast Buck" in November 1966. The Chiefs patterned it after Operation Moolah, the Korean War campaign where the U. S. offered $50,000 to any Communist pilot who would defect with a MiG-15. This time the JCS wanted a MiG-21. They recommended that $150,000 be paid for the first aircraft and $25,000 for the second. The U.S. would pay $25,000 to enemy pilots who defected by parachuting into the at sea. Another effective appeal offered cash rewards for weapons a defector turned in. 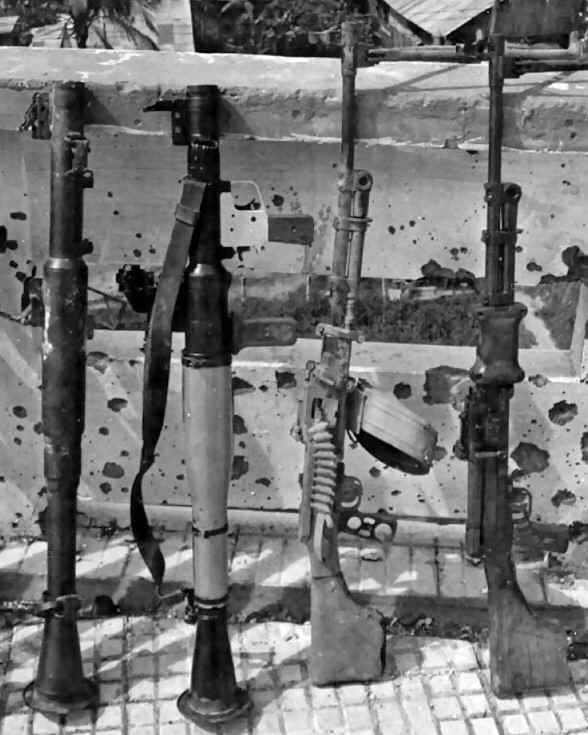 Rewards varied from time to time, but in 1970 ranged from the GVN equivalent of US$10 for a pistol and $25 for a rifle to $336 for an anti-tank gun. Small bounties were also paid for rice, salt and ammunition. Partial rewards were even offered for a long list of weapon parts. (One can imagine a group of green-eyeshaded bureaucrats spending months working that list out.) In a society so cluttered with weapons, the loss of weapons to the VC meant little. 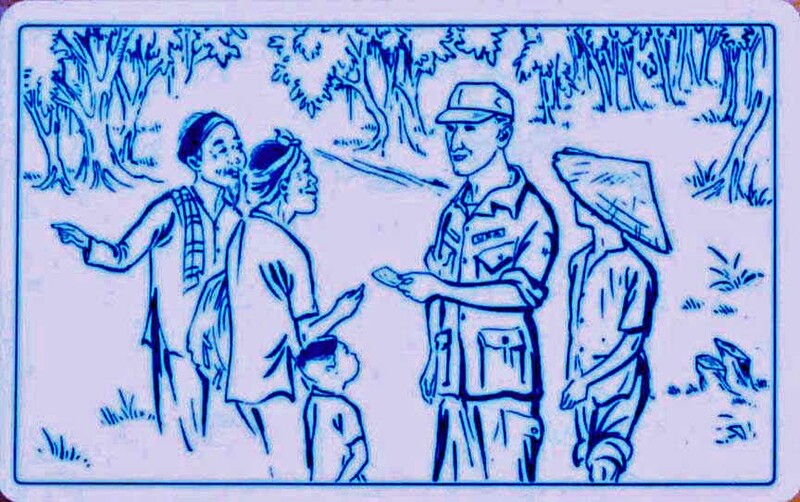 The real value of the reward system was to help a defector establish his bona fides to Chieu Hoi authorities, and to promise him a bit of money to start his new life. The PSYOP/POLWAR Newsletter, Volume IV, No. 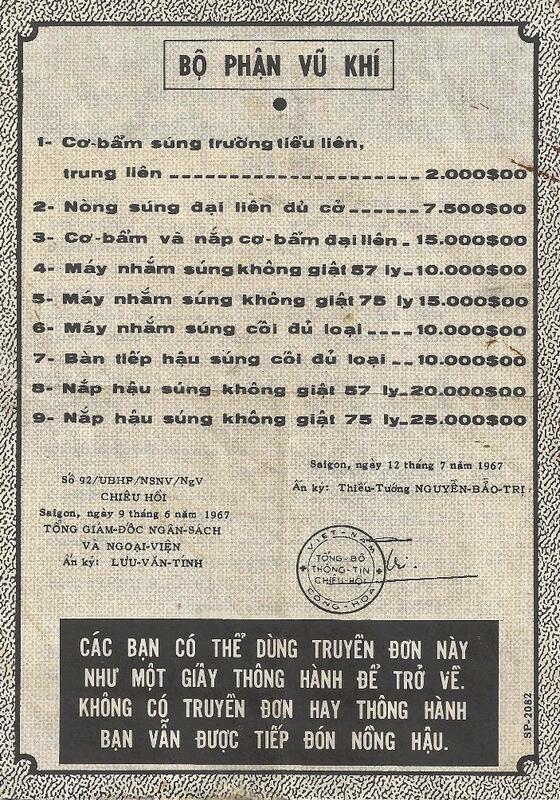 10, 31 October 1969 says, "The Government of Vietnam's newest reward program was announced in a communiqu� issued on 3 October 1969 by the General Political Warfare Department of the RVNAF Joint General Staff. As of this date, the Republic of Vietnam will generously reward North Vietnamese pilots, skippers, or crewmembers returning to the Just National Cause with an enemy aircraft, ship, tank, or with certain other weapons. The ralliers will be rewarded with 100 to 1000 taels of gold, depending on the value of the equipment they bring. The Republic of Vietnam and the RVNAF will warmly welcome the ralliers, provide them with security and protection and facilities necessary for their livelihood in Free Vietnam." At the time, 100 taels were worth approximately $11,000. Three years later the top secret MACV-SOG Command History reported, "The program for immediate monetary rewards to indigenous civilians was continued. Recipients were those who helped US captured or missing personnel return to friendly control, providing information, returned equipment or other evidence that revealed the status of US personnel, or returned remains of US personnel. 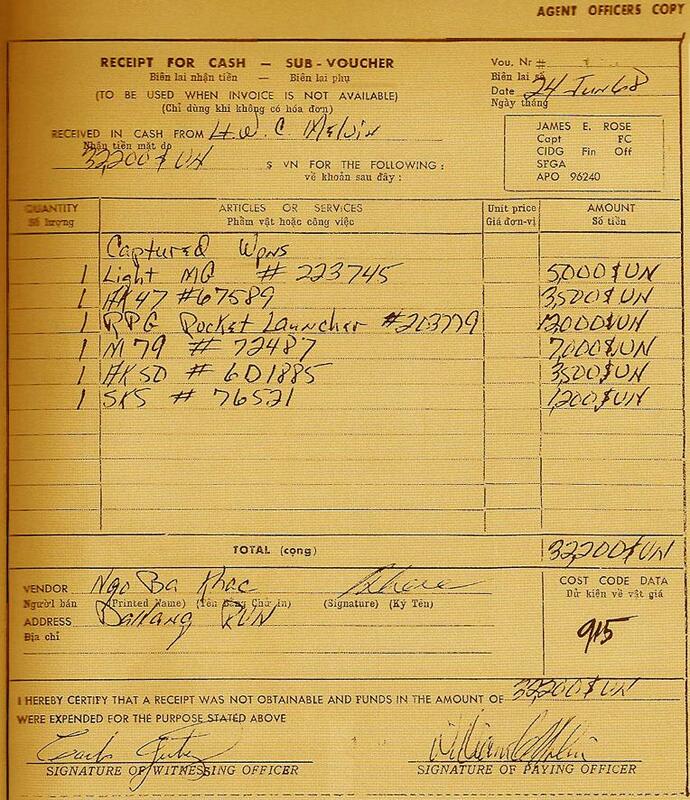 During 1971, the Allies paid a total of $1925 for the return, remains, or information that led to the return of remains and help in recovery operations. The early months of 1972 saw $400 paid for similar actions. The Allies dropped 98,336,000 leaflets over South Vietnam, Laos and Cambodia in 1971 to advertise the rewards program. The reward operations leaflet program during 1971 and 1972 were Operations Brown Stallion, Buffalo Track, and Elephant Walk. American PSYOP specialists printed the leaflets in Lao, Vietnamese and Cambodian with "pointee-talkee" pictures for illiterates. They dropped another 32,200,000 reward leaflets in early 1972. The following monetary rewards were authorized to indigenous civilians: $5,000 for returning US personnel, $500 for information leading to the return of US personnel, $400 for return of a body to friendly forces, and $150 for authentic information of status or location. The offers on the leaflets are in Vietnamese currency. If anyone has any information regarding American Missing in action or Prisoners of war, please report it immediately to the nearest American unit or to any Government of Vietnam or Army of Vietnam unit. Once the information is confirmed the informer will receive 41,250 piasters. His identity will be withheld. Compatriots: Those who return under the Chieu Hoi program are warmly welcomed, well-treated and assisted in many ways. Rewards for your weapons vary from $5,000 for a sub-machine gun up to $75,000 for a heavy mortar. The Government pledges that each returnee will have full citizenship in the Republic of Vietnam, medical treatment, and reunion with his family, assistance in finding a job, and financial assistance for food, clothing, lodging, furniture and building materials. Return Now! Chieu Hoi! 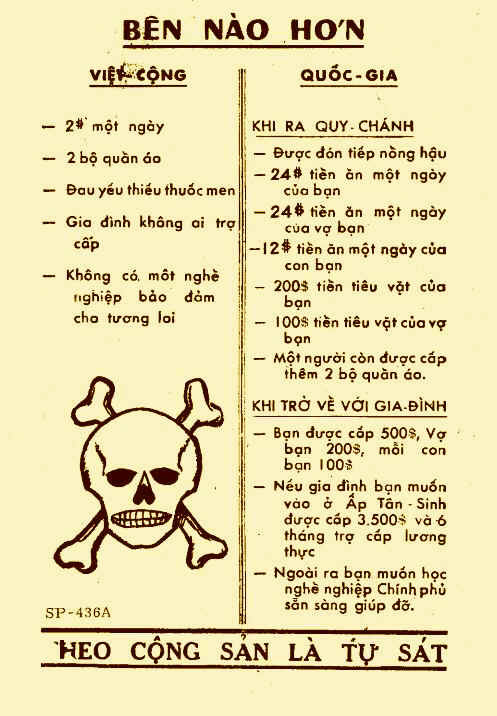 MACV prepared a lot of leaflets and pamphlets that featured pictographs rather than words, because populations in target areas were largely illiterate. Notice there is no text on the front of this card. 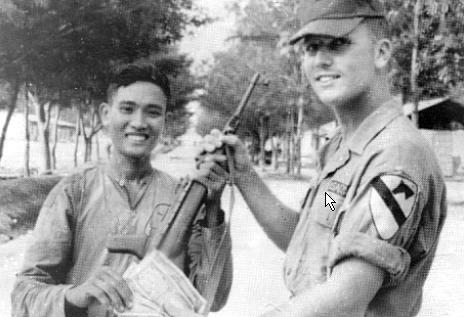 An American soldier simply hands money to a member of a small Vietnamese group that seems to be pointing to a safe direction. The card itself is completely plastic like an early credit card, made to last in the tropical heat and dampness of Indochina. I need your help to return home. I do not speak your language. I have run into trouble and so I am asking for your help. Please take me to someone who can protect me and help me to return to my own people. My government will give you a monetary reward and will be grateful to you. Please help me to return home. Propaganda and safe-conduct passes and leaflets were produced under the jurisdiction of the Joint U. S. Public Affairs Office (JUSPAO). JUSPAO was formed in July 1965, following 11 years of increasingly uncoordinated and inefficient psychological operations that began in summer of 1954 during Vietnam's transition from French rule. JUSPAO was given authority for all propaganda activities in an effort to end disputes and lack of coordination between Americans and Vietnamese and between American military and civilian agencies. With a civilian director (initially, Barry Zorthian) reporting to the U.S. Information Agency (USIA), JUSPAO integrated the psychological operations of the U.S. Information Service (USIS, USIA's overseas arm), The State Department's U.S. Agency for International Development (USAID), the Joint Chief's Military Assistance Command Vietnam (MACV), and the U.S. Embassy. JUSPAO carried out extensive campaigns to induce North Vietnamese troops to surrender. 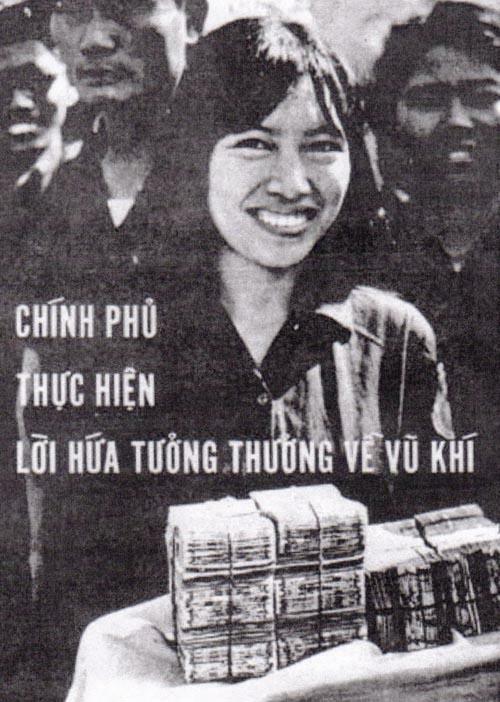 The bulk of money and attention was focused on the Chieu Hoi (Open Arms) program to encourage Viet Cong to "rally" to the cause of the Republic of Vietnam. 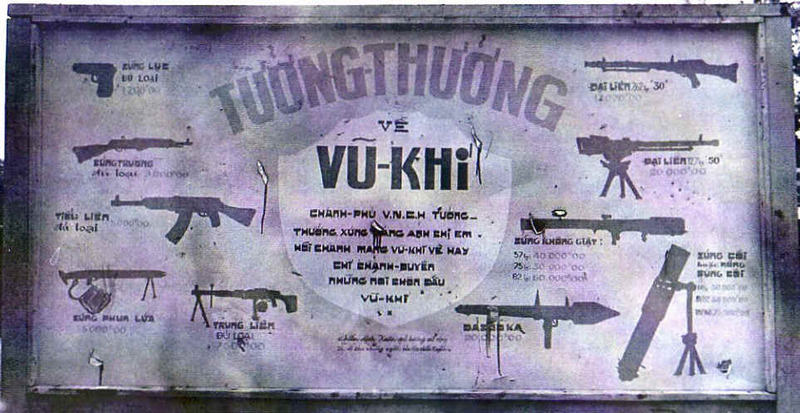 Begun in 1963 and administered by JUSPAO after its formation in 1965, the Chieu Hoi campaign resulted in billions of leaflets, millions of posters, magazines, and leaflets, and thousands of hours of loudspeaker exhortations encouraging Viet Cong defection; this is said to have been the largest propaganda campaign in history, with over 10 billion leaflets dropped in 1969 alone. In addition to offering amnesty and good treatment, monetary rewards were offered and paid to defectors who turned in weapons. Rewards were offered to third parties who induced Viet Cong to defect, with special bonuses for mass defections. These schemes were highly successful and were extended through 1969, but were terminated on 31 December 1969, possibly because of abuses in awarding the money. It is of course crucial that rewards be paid promptly, be equitable, and in line with those previously paid. 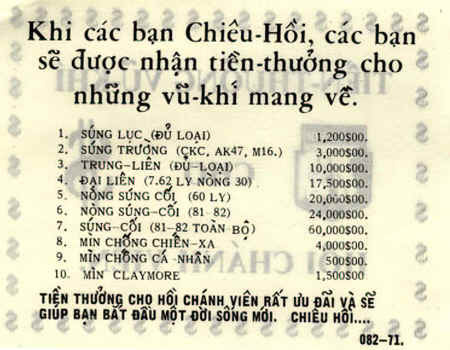 One snag developed in the Chieu Hoi reward system: Allied units to whom the VC rallied were prone to keep the weapons brought in (as trophies), refusing to issue the necessary receipt to the returnee. In order to ensure the credibility of the reward program, such practices should be forbidden and made subject to severe penalties. The weapons reward system was established by Decree No. 0144 of September 18, 1964, issued by Nghiem Xuan Hong, then Special Commissioner for Chieu Hoi. 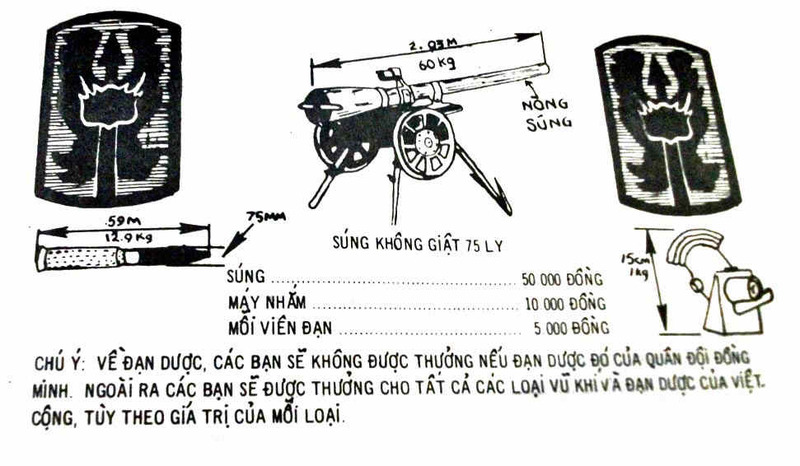 The system and rates for weapons brought in (from VN$800 for a pistol to VN$20,000 for a 75mm recoilless rifle) were reaffirmed in 1967 by the basic decree covering the organization and functioning of the Chieu Hoi Program (see Appendix 5). CORDS kept pressing for higher rewards, partly to increase inducement and partly to keep pace with inflation. In July 1967 (by Decree No. 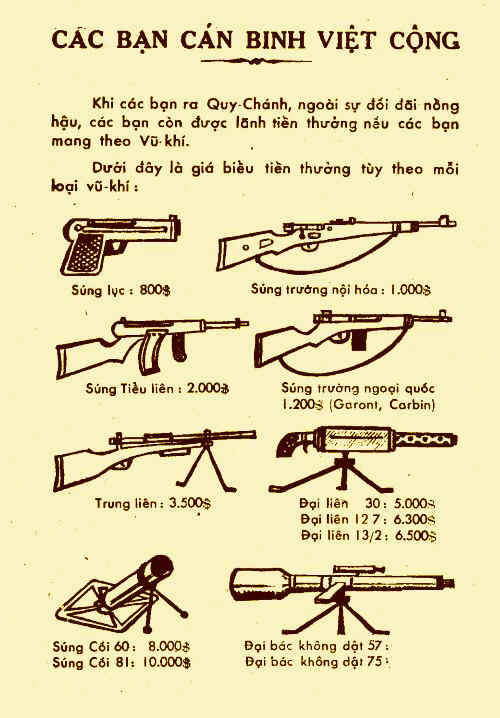 148), rates for weapons turned in by ralliers were again increased, and by March 1970 the rate ranged from VN$1,200 (approximately U.S.$10) for a hand weapon to as much as VN$1 million for leading allied troops to large enemy caches. Present this leaflet along with a weapon to the Special Forces Camp. You will be rewarded as well as escape from Viet Cong terrorism. The Special Forces will reward you depending upon each weapon that you hand in. In this article we will show a dozen or more leaflets that offer a reward for weapons. Not many people are aware of what happens after such weapons are turned in. 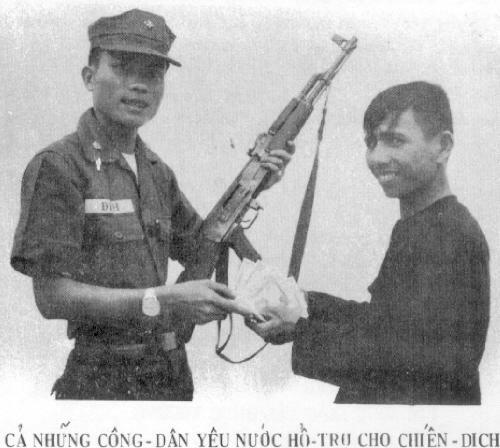 Here on 24 June 1968, a Vietnamese individual named Ngo Ba Khac of Da Nang, probably a Viet Cong who has gone Chieu Hoi, signs a receipt that shows he has received $32,200 in Vietnamese currency for handing over a machinegun, a rocket propelled grenade launcher, an M79 grenade launcher (blooper), and three assault rifles. 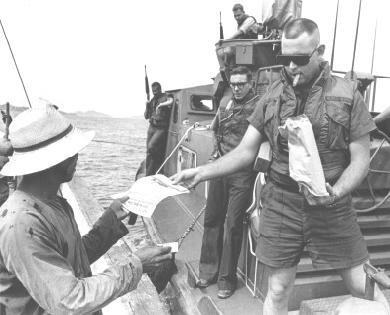 The receipt also protects the U.S. Army officer who paid the Vietnamese since it leaves a paper trail and shows that the cash was used in a legal purchase. 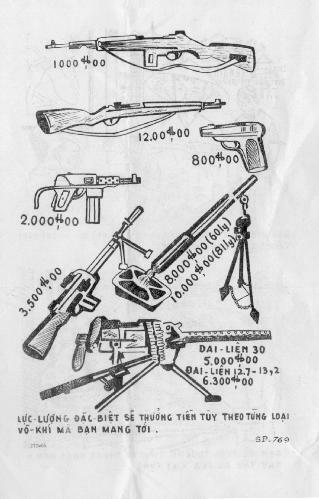 and the two on the right are Soviet-designed light machine guns. You can use this leaflet as a passport to return. If you dont have this leaflet, you will still be welcomed. 7. Reward for returned weapons - 500 to 7,800 Piasters. 11. Returnees living in the Open Arms village will receive: cement, metal roofing material, 10,000 Piasters for building costs, 2,000 Piasters for furniture, and a six-month supply of rice. Note: this leaflet was also disseminated with the Joint United States Public Affairs Office code number SP-951A. 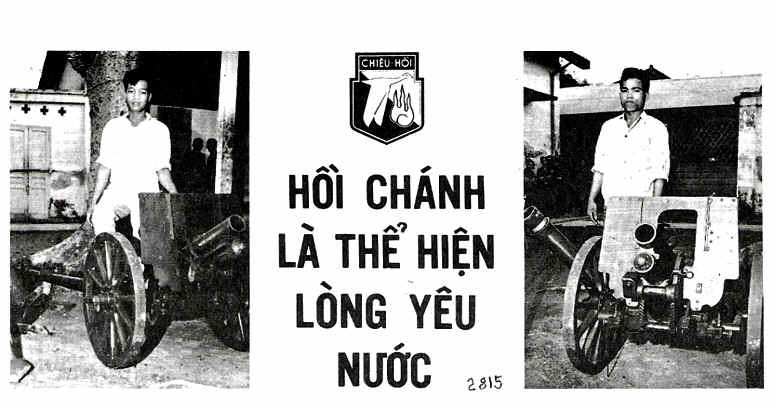 TO ALL LOYAL VIET CONG. The government of the Republic of Viet Nam will reward and assist you if you come back to the R.V.N. For all of the WEAPONS that you bring back, there is a reward according to the type you bring . 2000 Piasters for an M-3 "Grease Gun"
Here are instructions that will help you return home to the just National Cause. Keep one of the Republic of Vietnam safe conduct passes. Hide it carefully and await a favorable time to return. Wait patiently for a favorable opportunity; continue to demonstrate complete loyalty to the Viet Cong to avoid suspicion. When the opportunity comes, seize it. Leave the Viet Cong ranks at once and return to your family. If you can escape only at night, seek a hiding place. Report only in the daytime. Hide your weapon before reporting. After reporting, you can show friendly forces where the weapon is hidden and receive your reward. Always keep the safe conduct pass hidden on your body. If you have an unexpected chance to return to the National Government, or if accidentally arrested, you can show your good intention of going back home and to the just cause. Regardless of your situation, day or night, if you are investigated, show the safe conduct pass and be warmly received as a friend. 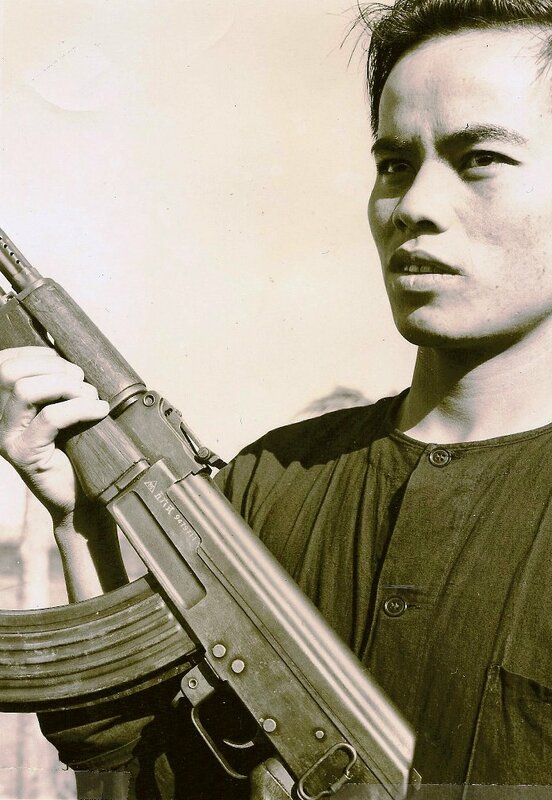 Vu Tuan Anh, a sergeant in the North Vietnamese Regular Armys 320th Division holds his Chinese Communist manufactured AK-40 automatic rifle which he brought with him when he defected. Sergeant Anh received 2000 piasters for the weapon when he came into the Pleiku Chieu Hoi Center. When you return to the Government of Vietnam you will be whole-heartedly welcomed and rewarded if you bring your weapon with you. This is the reward according to the type of weapon. Pistol $800, local rifle $1000, sub-machine gun $2000, foreign rifle $1200, Automatic weapon $3500, machine gun $5000 or $6300 or $6500, mortar $2000 or 10,000 and large gun $15000 or $20000. WHAT SIDE OFFERS THE MOST ADVANTAGES? When you are sick you have no medicine, No allowance for your family and No job for your future. You have an allowance of $500, your wife $200 and $100 for each child , You can live in a New Life Hamlet and receive a $3500 allowance and free food for six months, and If you want to enter any profession the Government will help you. The rewards for leaflets were not just placed on leaflets and posters. They were also posted on billboards as can be seen by the board in Nui Dat that offers rewards for various enemy weapons. Soldiers and Cadre of the Viet Cong and North Vietnamese Army in South Vietnam. The Government of the Republic welcomes returnees from your ranks under the Chieu Hoi program. Return and you will enjoy a life of peace and freedom. 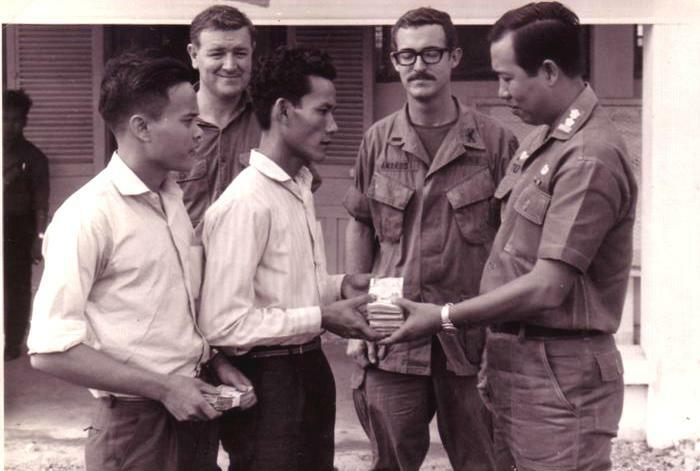 The Government of Vietnam pledges to each returnee: $30 each day for food and $200 each month for spending money, rewards for weapons brought in from $500 to 75,000, two suits or $1,200 for clothing, and $1000 resettlement fund for you and any member of your family when they leave the Chieu Hoi Center. Returnees with families also receive; $30 each day for wife and older children and $15 for younger children, $100 each month for each family at Chieu Hoi Center, and returnees who chose to live in Chieu Hoi hamlets will receive $12,000 and cement and roofing to help build and furnish a house and six months rice. JUSPAO prepared a set of four leaflets coded 2990-2993 which offered rewards for enemy personal and units. CHIEU HOI NATIONWIDE REWARDS CAMPAIGN. 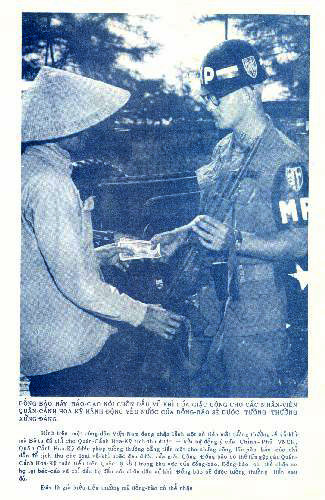 To invite all citizens of Vietnam to participate in a special program for the inducement on VC/NVA ralliers during the period of 1 November 1968 through 31 January 1969, and to give cash to all citizens who successfully persuade enemy military or civilian personnel to rally under the Chieu Hoi program. Awards will be paid to any Vietnamese citizen who induces a VC/NVA to rally, including members of the RVNAF, National Force, Cadre, Kit Carson armed propaganda teams (APTs), former Hoi Chanh or private citizens. The back of the note has a large "$" over a number of categories of personnel with the price paid for each. A basic principle underlying Chieu Hoi was that a man's loyalty cannot really be bought. However, it is possible-- without dragging a defector program down to a monetary exchange for a man's loyalty--to pay a third party for rendering a service, i.e., inducing a potential rallier to defect and having the rallier attest to his sponsor's bona fides in getting him to do so. Such a program was inaugurated in the summer of 1967 in Vinh Binh and Vinh Long Provinces. It proved quite successful. The November 1968, Accelerated Pacification Campaign extended the program to the whole country. 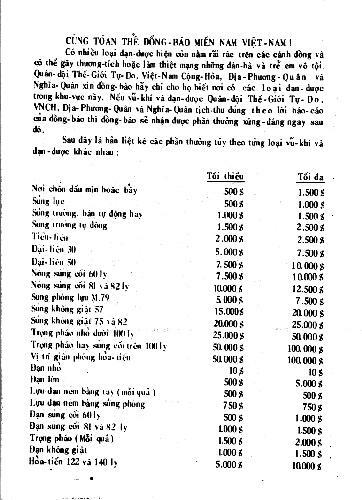 An intensive effort was undertaken to pay rewards to any Vietnamese citizen or Hoi Chanh instrumental in getting a VC or NVA to rally. Eligibility for reward was determined by a special committee at province, and amounts -- based on the rank of the rallier  varied from VN$250,000 for a commander of a Military Region to VN$3,000 for a member of the guerrilla force. But it soon became apparent that under the "Third Party Inducement Program," too many ralliers turned out to have a "third party inducer," sometimes a Vietnam Government official, who in fact had done nothing to induce the rallier. Chieu Hoi cadres at the centers were also found to be in collusion with ralliers coming into the centers with whom they would offer to split the "third party" reward. The Chieu Hoi Cadres of Long An Province. Deeply encouraged by the success of the Chieu Hoi program, the armed propaganda teams of long An welcomes the prime Minister and Vietnamese government officials to long An. The even was the opening ceremony of the Spring for the fatherland campaign. The aim of the Chieu hoi program is to urge those still on the other side to return to their families and alleviate the sorrows of separation. All persons (civilians, military, government employees, etc.) who induce Communist individuals or military groups to rally under the Chieu Hoi program will be paid cash awards. When an individual Communist rallies because of inducements, the responsible individual will be paid according to the rank or position of the returnee. In the case where a Communist military unit is induced to rally as a group, the individual inducing the group to rally will receive not only an award for each individual in such unit, but also an extra bonus which can be from 20% to 70% depending on the size of the group. The award in cash will be paid within three days to the individual responsible for inducing the rallier, either at province or district level. The rights of the individual who induces a Communist to rally or a group to rally will be respected and his name will not be disclosed. Village Company Commander $25,000, Deputy Village Company Commander $20,000, Guerrilla platoon Leader $15,000, Guerrilla Assistant Platoon Leader $10,000, Guerrilla Squad Leader $7,000, and Guerrilla Assistant Squad Leader $4,000. In cases where a Communist military unit is induced to rally as a group, the individual inducing the group to rally will receive not only an award for each individual in the unit, but also an extra bonus. The rights of the individual who induces a Communist to rally or a group to rally will be respected and his name will not be disclosed. It must consist of a minimum of three ralliers (one cell). They must all be from the same unit. They must rally together at the same time. If the unit is a squad or larger, at least two-thirds of its command cadre must accompany it as well as two-thirds of its combat members. Rights are guaranteed; identification will not disclosed. All citizens of Vietnam (civilians, military, government employees, etc.) who induce Communist individuals or military groups to rally under the Chieu Hoi program will be paid cash awards. The cash awards will be paid within three days to the individual responsible for inducing the rallier, either at province or district level. The rights of the individual who induces a Communist to rally or a group to rally will be respected and his name will not be disclosed. The leaflet is coded 246-398-68. The U.S. 25th Infantry Division will offer rewards for all kinds of weapons as shown in the above picture. You can bring the weapons to the U.S. Army or show them where the weapons you have discovered are located. Take this leaflet and give it to any U.S. soldier whether you bring the weapons in or you tell where the weapons are hidden. This is a translation of the paragraph written above in English. Attention U.S. soldiers: You are responsible to see that the bearer of this reward notice is escorted to the nearest U.S. Army Officer. The receiving officer will see that the bearer of this reward notice receives his reward. A PSYOP officer told me an interesting story about these reward leaflets. Note that in every case rifles and automatic weapons are worth far more than a pistol. This makes sense because they are far more dangerous, able to fire many times more bullets and at a greater range. The American officer told me that this was a terrible mistake. It enraged the Viet Cong and North Vietnamese Army officers who usually carried a pistol. They felt that offering a lowly uneducated peasant soldier more money for his weapon than a highly-trained and educated officer was a loss of face. There was some belief that this unbalance in rewards kept some officers who might have wished to defect from doing so. An interesting theory. 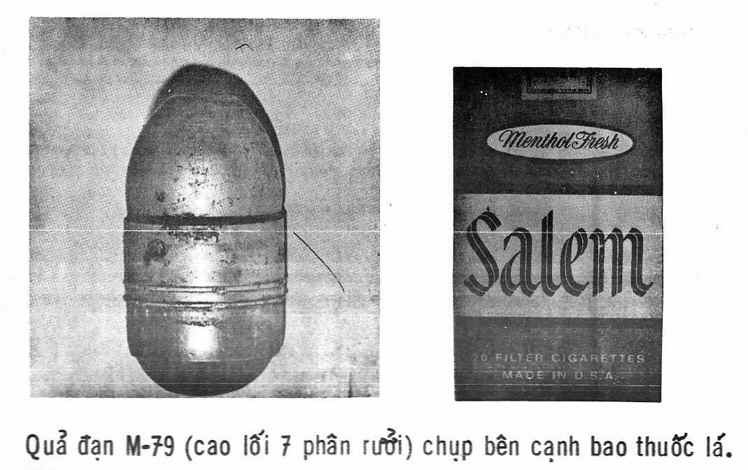 Leaflet 246-116-67 is entitled $500 Reward and offers $500 to any Vietnamese who reports finding an explosive device within one meter of the railroad tracks between Bien Hoa City and Gia Ray in Long Khanh Province. 50,000 of the 4 x 5-inch leaflets were printed at the request of the Railway Advisory Group. Be brave and show us or give us information on above items to sub-sectors, sectors, or ARVN and Allied units. You will be warmly received and properly rewarded. There are a number of American reward leaflets that bear the numbers 969. They seem to symbolize the virtues of the Buddha, Buddhist practices and the Buddhist community. The first 9 stands for the nine special attributes of the Lord Buddha. The 6 is for the six special attributes of his Dharma, or Buddhist Teachings. The last 9 represents the nine special attributes of Buddhist Sangha (monastic community). Those special attributes are the Three Jewels of the Buddha. Another veteran told me that a Vietnamese told him that the number 9 is a universally a lucky number, but in Feng Shui, 969 is the best of the lucky numbers: wealth, longevity, stability, etc. are concentrated in this number. It seems clear that someone did their homework and placed a lucky number on this leaflet hoping it would motivate a passing Vietnamese to pick it up. 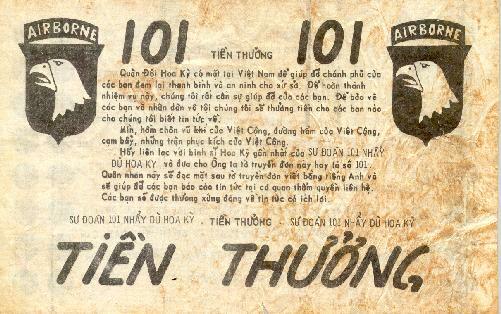 There are about a half dozen leaflets that use this number to catch the attention of the Vietnamese and offer a reward. All of the leaflets I have seen start with the 246 code and then follow with 118, 126, 157, 168, or 176. I suspect there are many more I have not seen. Leaflet 246-118-67 depicts the insignia of the U.S. 196th Light Infantry Brigade and the 969 and was printed in 100,000 copies. The code-name for the leaflet is Good Guys. The leaflet offers rewards for information on mines, weapons, tunnels, traps and ambushes. Leaflet 246-126-67 depicts the insignia of the U.S. 11th Armored Cavalry and the 969 and was printed in 100,000 copies. The code-name for the leaflet is Good Guys. The leaflet offers rewards for information on mines, weapons, tunnels, traps and ambushes. Leaflet 246-157-67 depicts the insignia of the 2nd Battalion of the 34th Armored Division and the 969 and was printed in 50,000 copies. The code-name for the leaflet is 969 Good Guys. The leaflet offers rewards for information on mines, weapons, tunnels, traps and ambushes. Leaflet 246-168-67 depicts the insignia of the U.S. 173rd Airborne Brigade. 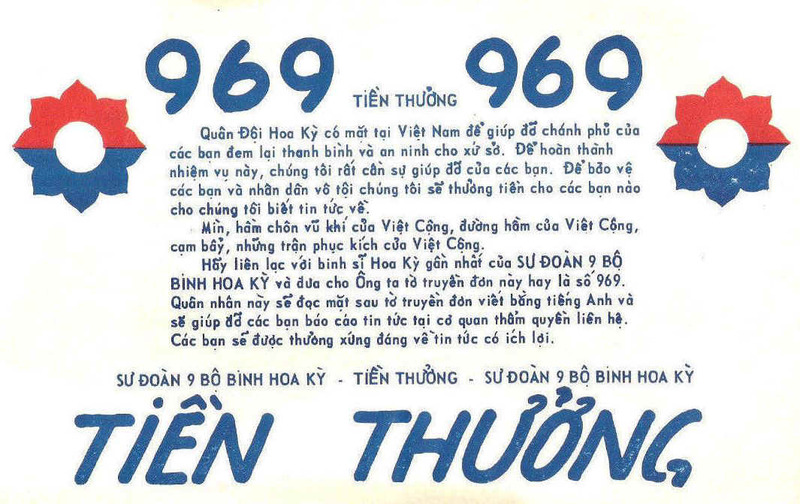 100,000 copies of the leaflet were printed bearing two images of the unit patch and the number 969. The code-name for the leaflet is 969 Good Guys. The leaflet offers rewards for information on mines, weapons, tunnels, traps and ambushes. The 246th PSYOP Company served III Corps from Bien Hoa, about 20 miles northeast of Saigon in III Corps. We will mention this unit in greater depth below. 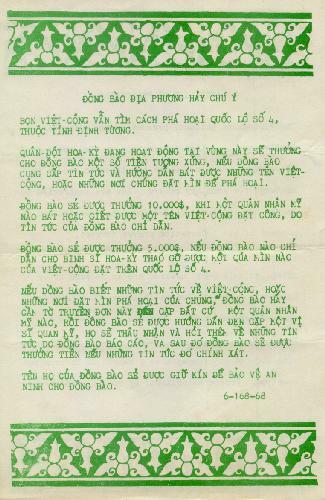 (In English and Vietnamese) The individual bearing this leaflet has information on VC cadre men. Take him immediately to the Brigade S-2. The leaflet is coded 6-083-68. It was dropped in VC areas, all Corps. Attention unit S-2. Rewards are to be paid after information is verified as follows: $10,000VN for each sapper team member captured or killed as a result of information received; $5,000VN for each mine located in Highway 4 as a result of information received. Prices established by 9th MI Detachment. 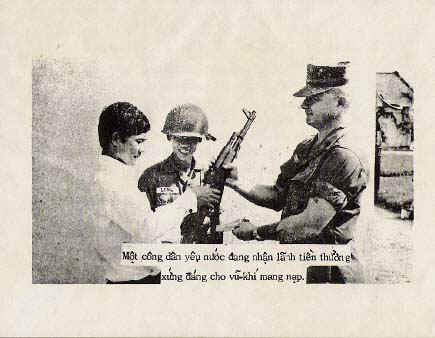 Province Chief Lieutenant Colonel Tu giving reward money to two ex-Viet Cong members for weapons rewards. The Australian is Sergeant Russ Tetlow and the US Officer is Lieutenant Andrus. The two returnees were given a reward of 1,020,000 piasters by the Minister of Chieu Hoi. 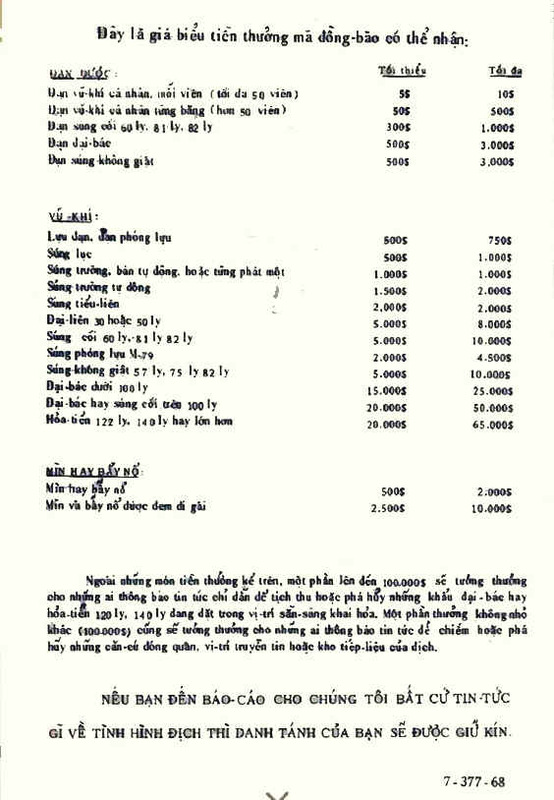 Note; Using the 1968 official exchange rate of 118 VND = $1.00 USD the two men would have been paid about $17,000 USD. Now at todays exchange rate they would get about $90.00 USD. 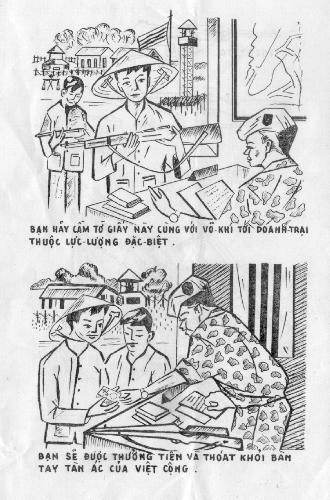 Leaflet 3224 depicts Chieu Hoi Minister Nguyen Ngoc An awarding Hoi Chanh Vu Van Tin $2,000,000 VN for helping the 24th Special Sector confiscate a massive number of weapons, ammunition and equipment from the Viet Cong. 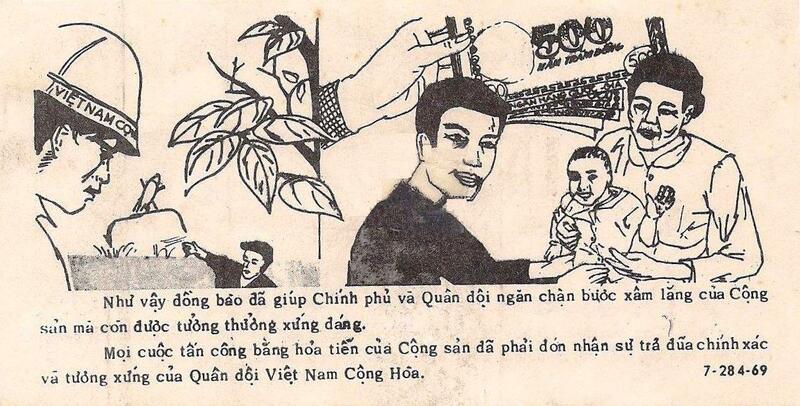 Leaflet 3691 depicts the Prime Minister and the Chieu Hoi Minister awarding $503,700 VN to Hoi Chanh Miss Nguyen Thi Be and $300,000 VN to Hoi Chanh Thach Nuoi. Two former Viet Cong recently reported the location of a Communist weapons factory to the Government of Vietnam and were rewarded 1,000,000 piasters by the officials of Bac Lieu Province on 19 August 1968. The factory was about 200 kilometers southwest of Saigon. 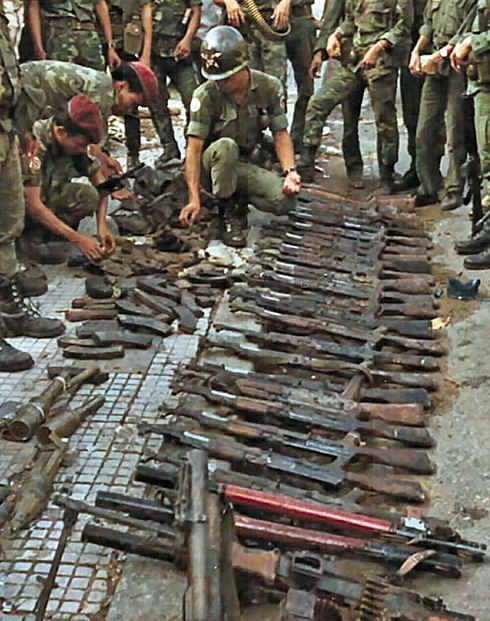 It contained more than 200 weapons, including a 70 mm cannon, a 105 mm mortar, and five anti-aircraft machine guns, I addition to more than 10 tons of ammunition and explosives which were destroyed by the local Government defense forces. Nguyen Van Ben, former VC Director of the weapons factory, and Nguyen Van Truong, former VC artillery commander, received the reward after disclosing the hidden Communist installation to the Government. Both men became disillusioned with the VC because it failed to achieve promised victories and did not provide them with food and clothing. 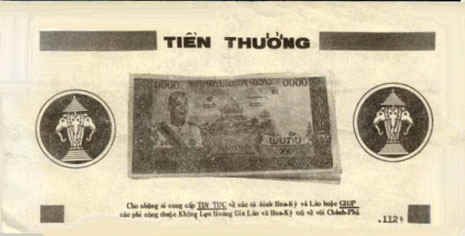 Leaflet 3778 depicts Chieu Hoi Minister Ho Van Cham awarding $1,348,000 VN to Hoi Chanh Nguyen Van Xang on 11 April 1970 for guiding ARVN forces on three occasions to seize Communist weapons. It appears the recipient can hardly hold so much money. On 10 February 1966, three companies were formed within the 6th PSYOP Bn to provide tactical propaganda support. The 244th PSYOP Company served I Corps from an initial station in Nha Trang (in II Corps), with a detachment in Quang Ngai in I Corps. The 245th PSYOP Company served II Corps from Pleiku (in II Corps). The 246th PSYOP Company served III Corps from Bien Hoa, about 20 miles northeast of Saigon in III Corps. 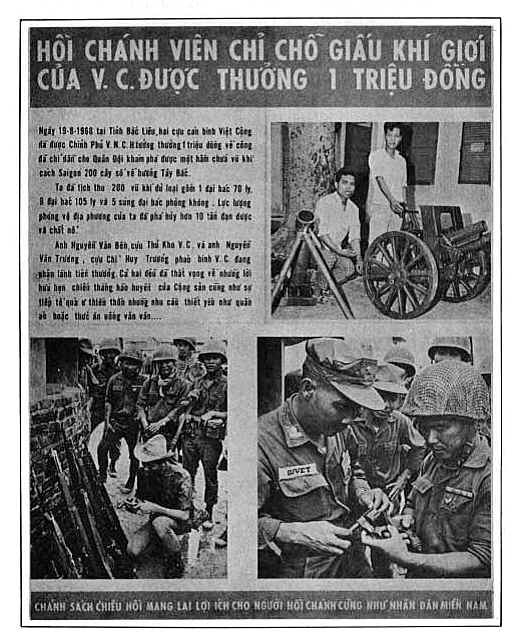 Later, on 19 November 1966, a fourth company, the 19th PSYOP Company of the 6th PSYOP Battalion, was formed in Can Tho to provide advice and support in IV Corps. Because of the increased need for psychological warfare support, the 4th PSYOP Group was constituted in the Regular Army in Vietnam on 7 November 1967, and was activated on 1 December 1967 with headquarters in the Saigon Rail yards (later, headquarters moved to the Tan Son Nhut Air Base near Saigon). The 6th PSYOP Battalion became the 4th PSYOP Group; the four companies currently operating in the Corps Tactical Zones became battalions within the 4th PSYOP Group. All four companies disappear from the order of battle as of 1 January 1968. The 4th PSYOP Group departed Vietnam on 2 October 1971. The Government fulfilled its promise to pay a reward for weapons. The 7th PSYOP Bn regularly dropped reward leaflets. 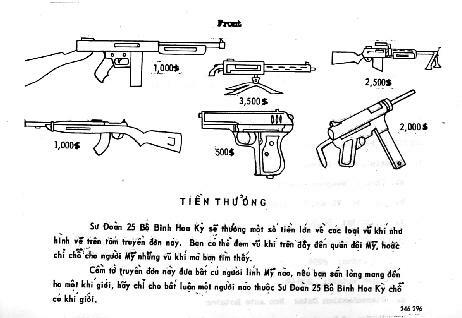 The 1968-1969 Leaflet Catalog of the 7th PSYOP Bn (Danang) shows 33 different leaflets in the "Reward leaflet" category. An additional 29 are listed under "Monetary appeal." Up to $100,000VN for information leading to the capture or destruction of artillery, mortar, rocket positions, troop concentrations, communication sites, occupied vehicle parks and logistic storage areas. Help save the lives of innocent people that might be killed by the bloodthirsty VC's weapons. Remember that a sizeable reward will be paid to you if your information leads to the capture or recovery of any weapons and ammunition. Warning!!! Do not pick up ammunition. Location of rocket launch site prior to firing $50,000-100,000, Artillery piece or mortar over 100mm $50,000-100,000, 75mm/82mm recoilless rifle $20,000-25,000, and just $10 for each small arms round. In the I Corps Tactical Zone, the 7th PSYOP Battalion of the 4th PSYOP Group was formed in Nha Trang from the 6th Bn's 244th PSYOP Company. In 1968, the 7th PSYOP Bn moved its flag (but not the unit or people) to Danang. It departed Vietnam on 21 December 1971. You can not only help to stop the Communist invasion, you can also get rewarded by the government. 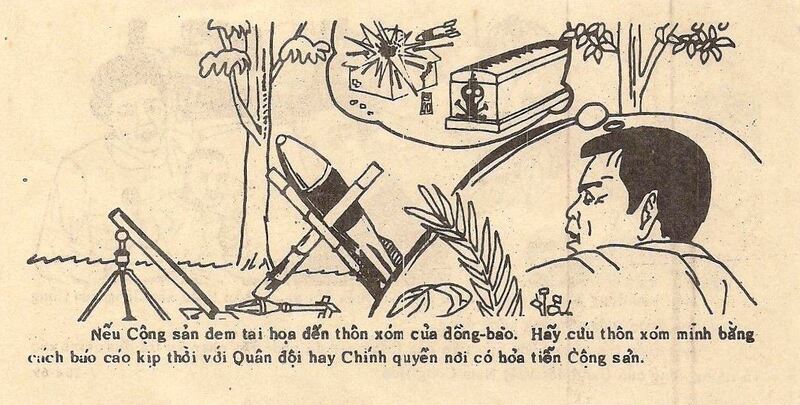 Any rocket attacks by the communists will be appropriately responded in kind by the Government of Vietnam. The Communists could bring disaster to your village. Please save your village by quickly contacting your local government or the military and showing them where you see rockets or mortars. A Patriot is receiving a worthy reward for a weapon delivered. Retired Lieutenant Colonel Joe Meissner tells an interesting story about distributing 7th PSYOP Battalion reward leaflets. He relates that four vehicles from the B team MIKE Force of the 5th Special Forces left their compound outside Pleiku, headed for a Montagnard village in the nearby hills. Two sergeants in a lead jeep unpacked a box, and as the convoy drove through a cluster of huts they tossed handfuls of leaflets into the air. The wind took the leaflets and scattered them along the road, over the fields and near the shacks. Children ran to pick the leaflets up and bring them home for their parents to read. The leaflet in question was 7-287-68. It depicted eight weapons and offered different rewards for each one. 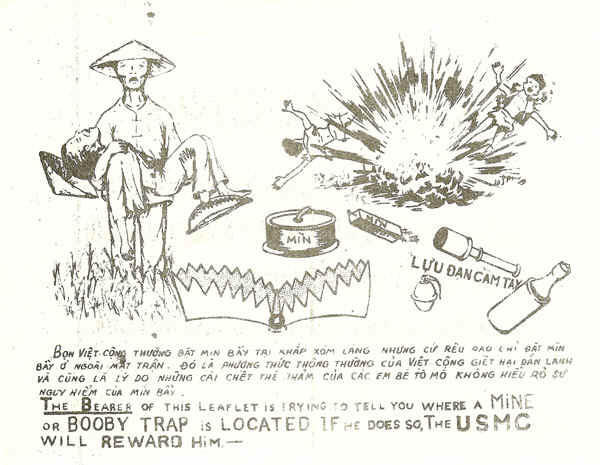 This leaflet entitled Report Viet Cong Rocket Locations was usually dropped in one of two reward leaflet mixes numbered either two or three. Rocket Reward Mix Two consisted of; 7-281-69 Report VC Rocket Locations, 7-282-69 Report Rocket Launching Sites, 7-283-69 Report VC Activity and Weapons and 7-284-69 Rewards for Rockets. I thought the readers might want to see what a Viet Cong rocket emplacement looks like. 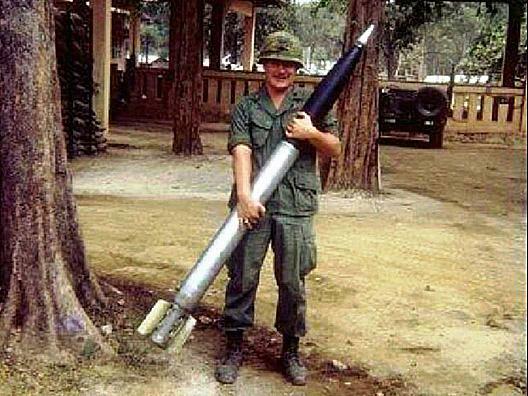 These 122 mm rockets were part of an original group of 22 found by Company G, 2nd Battalion, of the 1st Marines in May 1970. 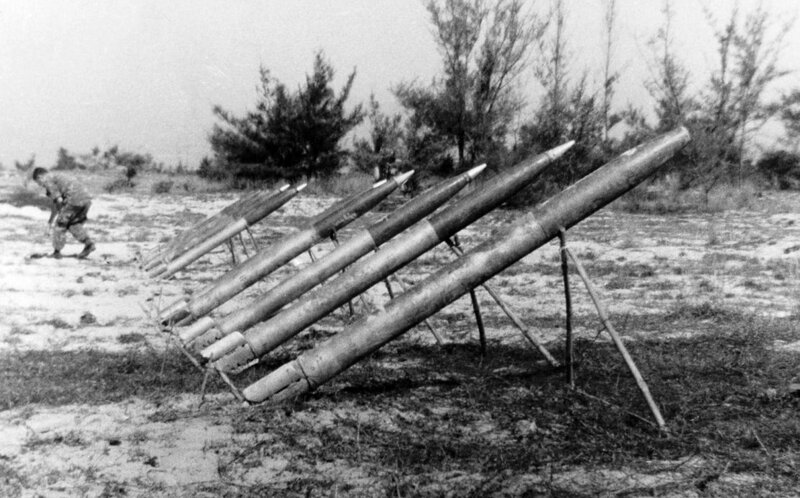 These rockets were aimed at Da Nang Air Base. If you have knowledge of rocket launching sites near your hamlet, report the information immediately. In doing so, you will prevent needless destruction and your patriotism will be generously rewarded. When you see an unexploded M-79 rounds, do not pick them up. They may explode at any time and cause a fatality. You should lead Vietnamese and Allied soldiers to recover them. You will be rewarded if you lead them to the location of the M-79 rounds. Those who take those rounds to the soldiers will not be rewarded. Curiously, the 7th PSYOP Battalion prepared almost the exact same leaflet two years later coded 7-505-71. This time there was no mention of a reward, just a request that the booby trap, grenade, rocket, artillery rounds, etc. be not touched by reported to the authorizes. Attention American Personnel. 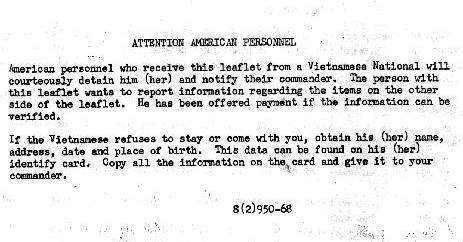 American personnel who receive this leaflet or a message from a Vietnamese national will courteously detain him (her) and notify their commander. This person wants to report information regarding the items on the other side of the leaflet. He has been offered payment if the information can be verified. If the Vietnamese refuses to stay or come with you, obtain his (her) name, address, date and place of birth. This data can be found on his (her) identity card. Copy all information on the card and give it to your commander. The U.S. Army is in Vietnam in order to help the Government of the South Vietnamese to bring peace and security to your country. In order to complete this mission we need your support. We will reward people who give us any of the following information: Any threats of missile, mortar or artillery that you have knowledge of, the movement of troops and weapons, preparations for attacks...."
Contact the nearest soldier of the US 4th Infantry Division and give him this leaflet or a 414. He will read the back of this leaflet, which is printed in English, and help you report the information to an official agency. You will then be rewarded with money equal to the information. The 8th PSYOP Battalion printed this reward poster in 1969. I like it a lot because it is very clear and even those that could not read well would certainly see the stacks of banknotes near each image and understand that they could get a lot of cash by turning in their weapons. I usually add a translation but this poster is in a native montagnard language (most likely Rhade), and my Vietnamese translators cannot read it. We see mortars, rockets, automatic weapons and even a pistol. 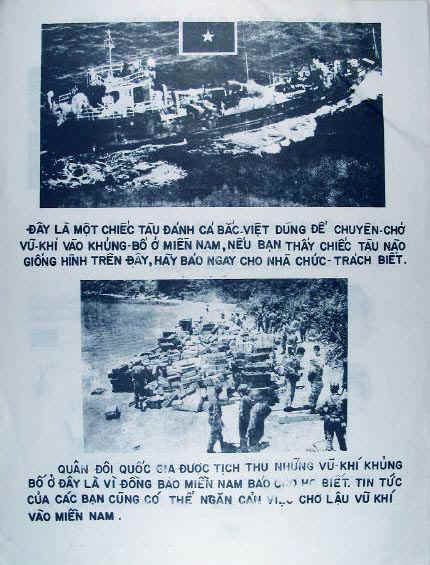 This leaflet was sent to me by Rick Levine who was a Specialist 4th Grade (SP4) photographer (MOS 84B20), assigned to Company A, in Nha Trang, from March 1968 to December 1969. Rich had asked the Army to assign him to photography school but was told there were no openings; he could be schooled as a camera mechanic. He went to basic training at Ft. Ord, California and advanced training at Ft. Monmouth N.J. When he got to Vietnam he asked permission to visit the photography unit and showed them his portfolio which he carried all the way to Vietnam. They liked his work and offered him the job on the spot. Company A operated with C Flight, 9th Air Commandos Squadron, to provide PSYOP support to coastal provinces. When I spoke to Rick about his photographs he sent me this photograph he took of a C-47 "Spooky" gunship in action bringing death and destruction to the Viet Cong. In II Corps, the 8th PSYOP Battalion of the 4th PSYOP Group was formed in Nha Trang from the 6th PSYOP Bn's 245th PSYOP Company. In Pleiku, Company B of the new 8th PSYOP Bn was formed from a small detachment of the 245th Company. Later, in 1968, all of the 8th PSYOP Bn moved to Pleiku, where it served in close association with the 4th Infantry Division. It operated there until it departed Vietnam on 26 June 1971. During the Vietnam War, American soldiers and airmen were often in danger in the nations bordering Vietnam as their missions called for them to overtly or covertly cross the borders into the "neutral" countries to attack or pursue the NVA units hiding in the jungle, or the supply columns coming down the Ho Chi Minh Trail. The United States Government will pay you $500 for information leading to the safe rescue of a U.S. serviceman. JUSPAO leaflet #4369CV has the text in Vietnamese on one side and Cambodian on the other. Leaflet 4369LC is identical except that the languages are Lao and Cambodian. Leaflet 4369LV is in Lao and Vietnamese. Leaflet 4369V has the cartoon and text in Vietnamese on the front and the back has a picture of a $500 bill. The United States Government will pay you $5000 for information leading to the safe rescue of a U.S. serviceman. 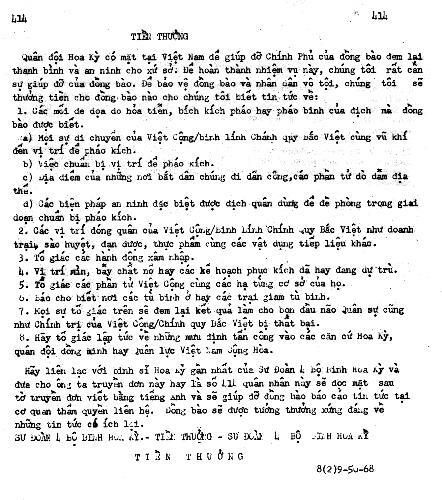 The text is in Cambodian and Vietnamese. 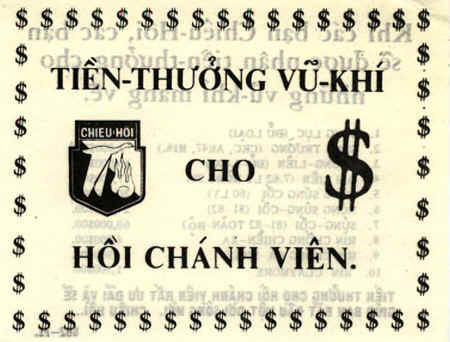 Once again, the LC version has Lao and Cambodian text, the LV version has Lao and Vietnamese, and the final V version in Vietnamese and depicts a picture of a $5000 bill. 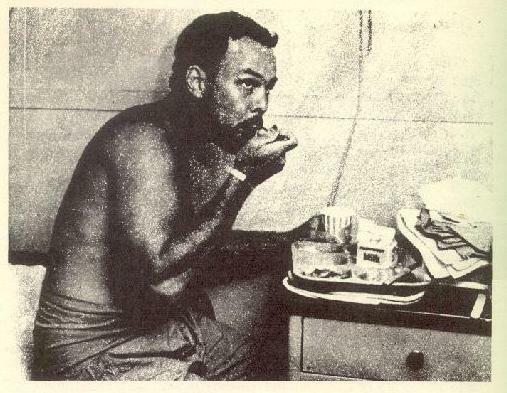 On 8 October 1971, the Communists released one U.S. POW, Sergeant John C. Sexton, in Loc Ninh. On 11 October 1971, the Government of Vietnam released a North Vietnamese lieutenant in the same area that the Viet Cong freed the American POW. This is not a reciprocal action but it reflected the Government of Vietnams hope to have more POWs released so that they may return to their families after years and years of separation. It is interesting to note that the leaflet says this is not a reciprocal action when it clearly is. The United States could not be seen to be trading Communists for POWs, but it was certainly pushing the Government of Vietnam to do so. At the same time, one wonders what the Viet Cong could gain by such an action. The long-term holding of U.S. troops was part of their plan to wear down the American support for the war. We cannot use this one on POWs. Im sorry. Army Staff Sergeant John Sexton, was suddenly and without warning released from a VC prison camp near the Cambodian border. At first Sexton was accompanied by NVA soldiers but he was then abandoned near the small town of Snoul in Cambodia to make his own way back. Sexton, who was dressed in black pajamas and carried a message from the communists asking for reciprocity for his release, said that once he reached American lines no one on his own side was interested, other than to impress upon him that be was to keep his mouth shut. Allegedly, for years after his return, he could not speak at meetings held by the families of other prisoners without an ever-present government representative to insure his silence. When one digs further into the story we find spies and spooks and political bickering. Apparently, the Communists wanted two of their high-ranking people back, a labor agitator named Le Van Hoai and a top terrorist leader named Nguyen Van Tai who had run intelligence and terrorist operations in Saigon for more than five years that had killed or wounded hundreds of South Vietnamese and Americans. The CIA argued against releasing them for a mere sergeant. The Communists then offered Douglas K. Ramsey, a Foreign Service Officer they had seized north of Saigon in 1966. The CIA wanted the return of one their officers who had been captured during the 1968 Tet Offensive. After a lot of haggling it became clear that the sides could not agree and the offers to trade were withdrawn. Friends, when you Hoi Chanh you will receive rewards for your weapons. The rewards for Chieu Hoi are generous and will help you start your new life. The Viet Cong always place mines and traps around villages and play grounds - but then claim that they only place those mines in the battlefields. It is their common practice to kill innocent citizens, and that is the reason curious children who do not recognize mines are killed. The bearer of this leaflet is trying to tell you where a mine or booby trap is located. If he does so, the USMC will reward him. The Marine Corps will reward a considerable amount of money to whoever leads us to Viet Cong traps or takes us to the place where the traps are hidden. The cowardly Viet Cong hide booby traps not caring who is hurt by them. Innocent civilians are most of the victims. Tell the Marines where they are hidden. You will receive a generous reward, and the Marines will remove this danger so that your children will be safe. The M50A1 tank-killer "Ontos" (Greek for "The Thing"), officially known as the Rifle, Multiple 106 mm, Self-propelled, M5 was a light weight tracked armored fighting vehicle designed to destroy enemy battle tanks using the firepower from its six 106mm recoilless rifles. The Marines had 176 Ontos vehicles at the start of the Vietnam War. 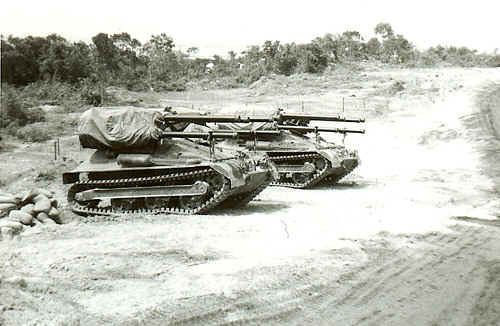 Howard Beck sends a photo of his units tank killers taken in Chu Lai, in spring 1966. 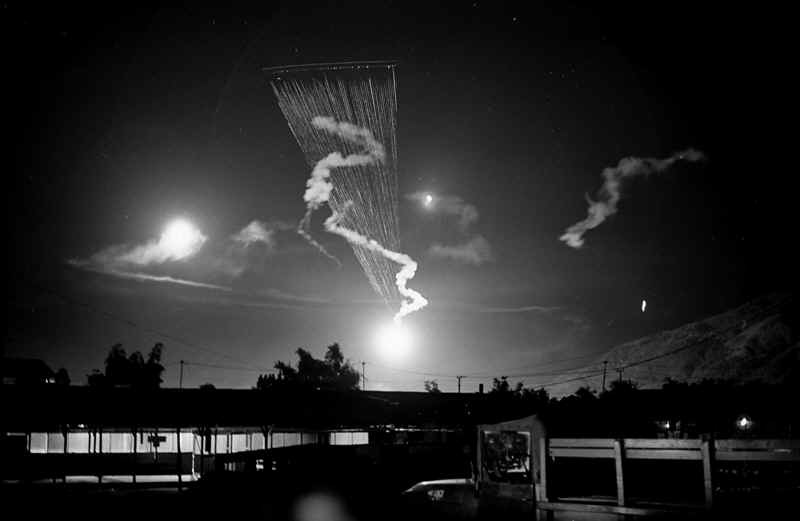 During the Vietnam War US ground and air forces were covertly and overtly active in nearby Laos. 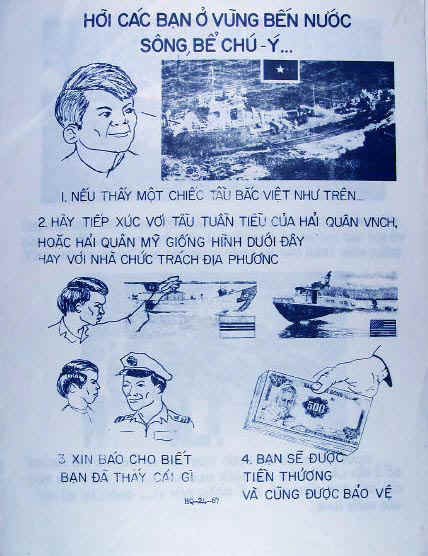 The United States prepared a number of propaganda leaflets to the Pathet Lao and Lao civilians depicting Royal Laotian currency and offering rewards for the return of American and Laotian pilots. 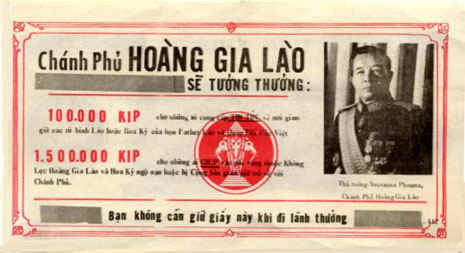 The leaflets were mostly black and white but often had a touch of red where the symbol of Laos was depicted and rewards were mentioned. The notes were prepared in two sizes, standard 3 x 6-inch leaflets and 6.29 x 11-inch handouts. With wealth you can make wonderful things. For information on Royal Laotian or U.S. prisoners of war or for assisting Royal Laotian Air Force or U.S. pilots back to the government. Souvanna Phouma, Prime Minister, Royal Lao Government. 100,000 kip for information on the location of Royal Lao Government or U.S. prisoners held by the Pathet Lao or North Vietnamese Army. 1,500,000 kip for assistance to Royal Lao or U.S. pilots returning to the government. You need not keep this paper to collect the reward. A cash reward will be given to those who provide information concerning U.S. and Laotian prisoners, or who assist Royal Laotian and U.S. pilots in returning to the government. 100,000 kip to those who provide information concerning U.S. or Laotian prisoners of the Pathet Lao and North Vietnamese Army. 1,500,000 kip to those who help Royal Laotian and U.S. pilots who are downed or being detained by the Communists to return to the government. 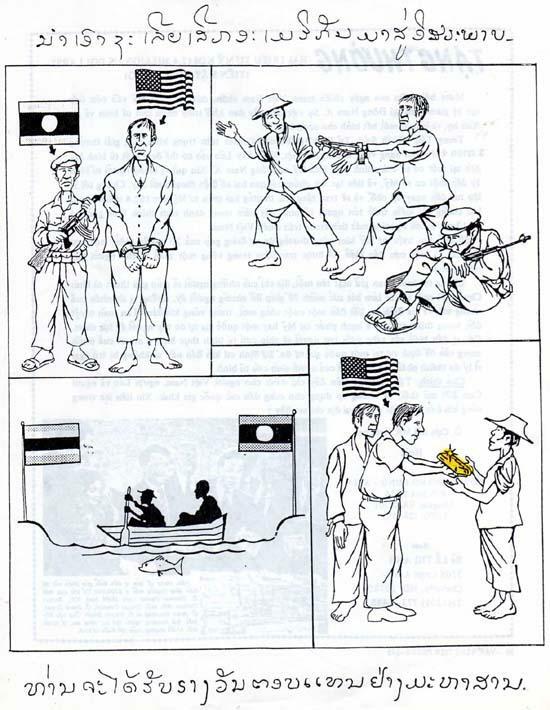 U.S. reward leaflet .114 for Laos is made up of two identical cartoons that appear on both the front and back. The only difference is that the text on one side is written in Vietnamese, the other side in Laotian. The first illustration (at left) depicts a downed Allied pilot meeting villagers. 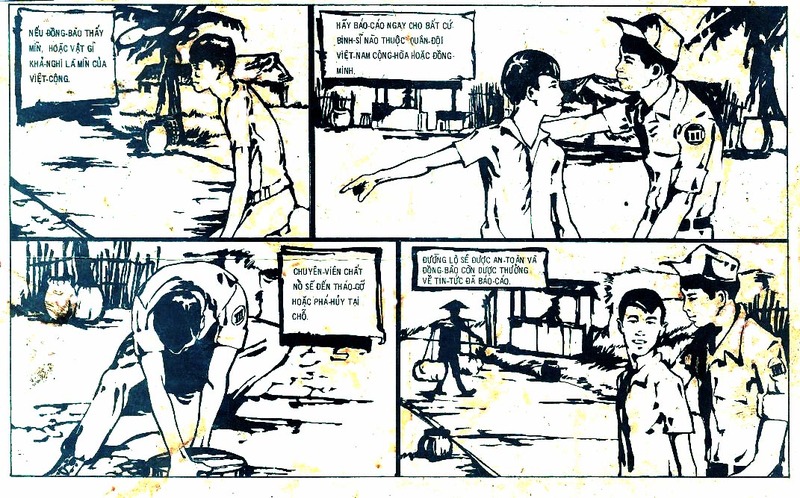 The second illustration (at right) depicts the pilot and a friendly villager meeting a government officer who rewards the villager with a cash payment. 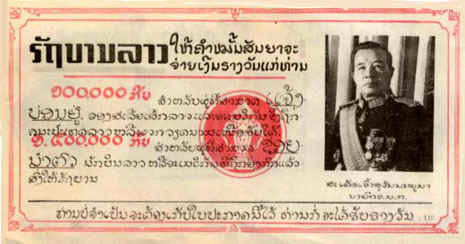 1,500,000 kip: A cash reward to those who help Royal Laotian and U.S. pilots who are downed or being detained by the Communists to return to the government. 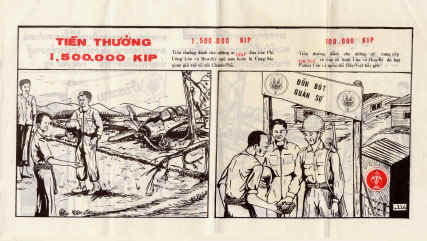 100,000 Kip: A cash reward to those who provide information concerning U.S. or Laotian prisoners captured by the Pathet Lao and the North Vietnamese Army. Are there still reward leaflets circulated in Vietnam today? The answer is "yes." In 1987 the POW Publicity Fund offered a $2.5 million dollar reward and expected the Department of Defense to honor an additional $100,000 reward offered in the pilots blood chits. The offer was offered by 21 Republican Congressmen, former POW Navy Capt. Eugene "Red" McDaniel, former North Carolina Congressman Billy Hendon and the owners of the Charlotte Motor Speedway. Each of the 24 pledged $100,000 (making the 2.4 million). The POW Publicity Fund $2.5 million dollar reward is pledged by current and former members of Congress, private citizens and corporations. The reward will be paid to any citizen or group of citizens of Vietnam, Laos or Cambodia who liberates an American prisoner of war detained against his will in Vietnam, Laos or Cambodia and delivers the prisoner to U.S. custody. The reward will be paid only if the American prisoner is delivered to an official U.S. Government facility. Qualifying facilities include, but are not limited to, the U.S. embassy in Hanoi, Vietnam; the U.S. MIA office in Hanoi, Vietnam; the U.S. embassy in Vientiane, Laos; the U.S. MIA office in Vientiane, Laos; the U.S. embassy in Phnom Penh, Cambodia; the U.S. MIA office in Phnom Penh, Cambodia; the U.S. embassy in Bangkok, Thailand; the U.S. MIA office in Bangkok, Thailand; embassies or other official U. S. Government facilities in China, Burma, Malaysia, Singapore, Indonesia, Brunei, the Philippines, Taiwan or Hong Kong and any U.S. Navy vessel on the high seas. The reward will be paid only if the American prisoner is on the official U. S. Government list of "U. S. Personnel Unaccounted for in Southeast Asia." The reward will be paid only after extensive interviews have been conducted with both the rescuing party and the alleged prisoner to determine if, in fact, the said prisoner is a bona fide prisoner of war. The interviews will be conducted by authorized representatives of the POW Publicity Fund who are experts in the field of American prisoners and missing in Southeast Asia. The $2.5 million dollar reward will be paid by the POW Publicity Fund only once, and only to the first person who qualifies. Should the person qualifying for the reward liberate and deliver more than one prisoner to the U.S. Government, only $2.5 million dollars will be paid. In other words, payment will be for the rescue event rather than on a per-prisoner basis. 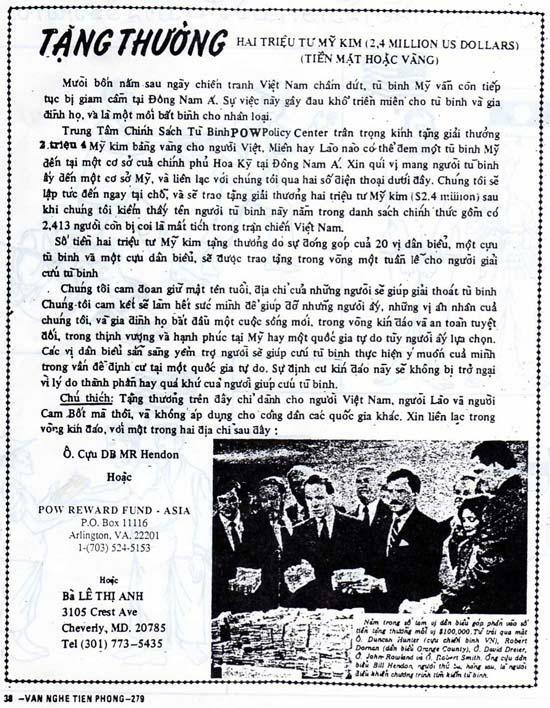 The POW Publicity Fund official reward document explains the $2.5 million dollar reward in the Vietnamese and Laotian languages and in pictures. The reward offer is in the form of a pointee-talkee leaflet. There are four drawings on one side. The first shows an American held prisoner by an armed Laotian, identified by the flag of the Lao People's Democratic Republic above him. In the second picture the American escapes, led away from a sleeping guard by a friendly native. In the third picture the friendly Laotian rows him to Thailand, identified by the flag of the Kingdom of Thailand on the far shore. In the final picture, the Americans reward the friendly Laotian with bright shiny gold. Text in Laotian is, "Bring an American pilot to safety and you will receive a huge prize in return." You should have seen us at the airports and on the plane coloring the "gold" block and folding the leaflets and putting them in zip lock bags! We took a cheap group flight on Korean Air Lines via Alaska. I think in all it was over 30 hours with the long airport waits. I don't remember how long we had to wait in Alaska, but I remember sitting on the floor doing the leaflets and people staring at me. Same on the plane. We must have looked like a bunch of crazy people with our yellow markers, leaflets and boxes of zip-lock bags! The same organization also prepared reward labels, which were stuck on Russian banknotes and disseminated in Vietnam and Laos. One such 5-ruble banknote of 1961 bears a label with English-language text "$2,400,000 REWARD for American Prisoner of War delivered to International Red Cross." The same message appears directly below in Vietnamese. 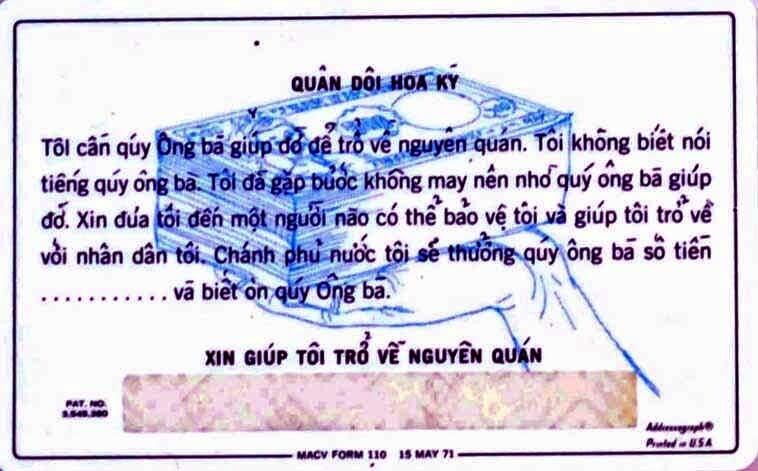 The use of banknotes as a medium for propaganda is explored in another article: Propaganda Banknote Leaflets of the Vietnam War. We were told if we tried to release them they would be shot down and placed under house arrest. The next day, out of frustration, we began wading into the Mekong and trying to push the sealed reward leaflets into the current towards Laos. It was spontaneous but it made international news, I guess because it really was a desperate pitiful attempt and the Thai went out in boats and were picking them up. Plans to launch 2,500 11-inch helium balloons were prohibited by the Thai government. In July 1988, Lynn Hampton, a Vietnam War army nurse traveled to Vietnam with a small missionary group. Hampton had just graduated from the University of Florida School of Nursing when she joined the Army Medical Corps and arrived in Vietnam in March 1967. She was first assigned as a surgical intensive care and medical intensive care nurse at the 91st Evacuation Hospital in Tuy Hoa. After six months, she was transferred to the 93rd Evacuation Hospital in Long Binh near Saigon. She later wrote a book about her wartime experiences: The Fighting Strength: Memoirs of a Combat Nurse in Vietnam, Daring Books, OH, 1990. 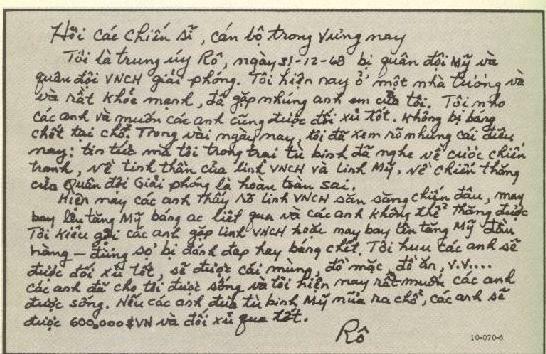 Hampton bought 3,000 Vietnam Dong on the black market and handwrote the reward message on each of them along with Capt. McDaniels telephone number in Washington DC. She covertly disseminated them around Hanoi. That operation was dubbed Dong the Cong I.
Dong the Cong II started on 3 October 1988. Vietnam Veteran Jim Copp and Donna Long went to Khong Chiam, Thailand as advance party for the Homecoming II Group. They had at least 1,000 dollars in currency with a reward message stamped on them. The stamp was identical to the label stuck on the banknote above. Donna believes that most of the banknotes were Thai 5 and 10 Baht, about one-third were American one dollar bills and there were a few Russian rubles. They planned to rent a boat, place the currency in zip-locked bags in the middle of the Mekong River and push them towards the Lao side of the river. They saved some of the bank notes to pass out to people in Laos and bribed the Thai boatman with currency and a bottle of Jack Daniels to take them to a Lao fishing village. On an impulse they then decided to go into Laos and distribute some of the banknotes. 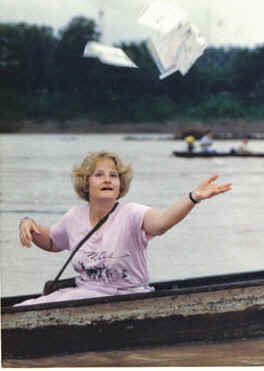 They crossed the river to the Lao fishing village of Ban Mai where Donna passed out the bills while Jim took video and photos. As they were ready to leave, two armed soldiers appeared. The two were arrested and eventually held in the Pakse police station for eight days. Donna pretended to be an innocent woman who was looking for lost Americans who might not know the war was over. She was continually interrogated and signed a "confirmation" that stated she was sorry that she had broken international law. Meanwhile, the other 5 members of Homecoming II Group had arrived in Thailand, rented a boat and after tossing about 5,000 mixed currency bills into the Lao side of the Mekong, were arrested by Thai Navy and held for about 4 hours. Jim and Donna were flown from Pakse to Vientiane on the 9th day. A Dozen Lao armed with rifles blindfolded them and took them to a building. On the way the two were threatened with guns placed at their heads, but it turned out to be a joke played by the Lao on their American captives. Donna was held in what looked like an office that had been turned into a cell. She was visited twice by a Mr. Steele from the American Consulate during the next 30 days. She was interrogated by a "judge" who acted as a prosecutor and defense attorney. He was not fooled by her innocent act and Donna was told later that he was KGB. I was held from 3 October to 12 November 1988; 41 days, 2 hours and 23 minutes, but who the hell is counting. 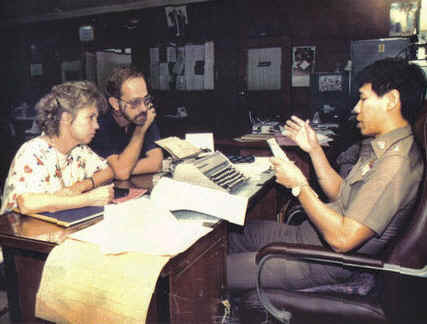 After their release from Laos and return to Thailand, Jim and Donna were told by a Thai Captain that they would be held in jail for the weekend. Donna told him that she was sick and her medicine was in her hotel room. She pointed out to the Captain that it would not look good if after surviving 41 days in communist Laos, she died during a weekend in a Thailand jail. The Captain quickly released her. 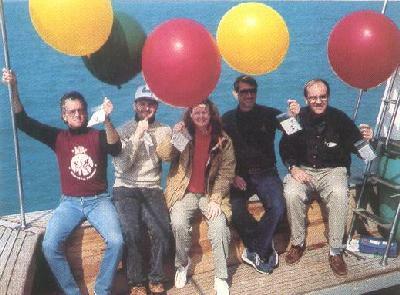 In February of 1989 The group led by former Congressman Billy Hendon sailed a converted Vietnamese fishing boat off Hainan Island where they released 600-700 multicolored balloons into the wind currents flowing toward Vietnam and Laos. The United States Government officially offered a reward again in 2006. According to the Associated Press, the U.S. government offered a $50,000 reward on 11 November 2006 for information leading to the recovery of an Iraqi-born American Army translator kidnapped in Baghdad three weeks earlier. Ahmed Qusai al-Taayie, a 41-year-old reserve soldier from Michigan was abducted by gunmen on 23 October while visiting his Iraqi wife at her familys home. Allegedly, the kidnappers demanded $250,000 in ransom. We have barely scratched the surface of the use of reward leaflets in Vietnam. This article is intended only to introduce the subject. Interested readers are encouraged to write to the author at sgmbert@hotmail.com.